The Cape Parrot (Poicephalus robustus robustus) is also known as Tori Parrot or Brown-necked Parrot. All three subspecies have dark green upper parts, light green lower parts and have orange on their shoulders. Juvenile birds have orange foreheads, which is retained on adult female parrots and is lost from the male parrots on maturity. This sexual dimorphism (visual physical differences between the sexes) enables adult birds to be visually sexed. This parrot's range includes portions of West Africa, East Africa, and south from there to South Africa, including the eastern Cape region (please refer to distribution map below). The nominate Cape Parrot (Poicephalus robustus robustus) is endangered, but the two subspecies are found more widely in Africa. Their habitat is being eroded in large part due to the logging of African Yellowwood trees. Additionally, many have succumbed to the fatal Psittacine beak and feather disease (PBFD). The nominate form ( Poicephalus robustus robustus) is now classified as an endangered species by the World Conservation Union (IUCN). The populations are difficult to count as the habitats have become fragmented, and because they fly long distances for food. A recent increase in the population has been suggested. 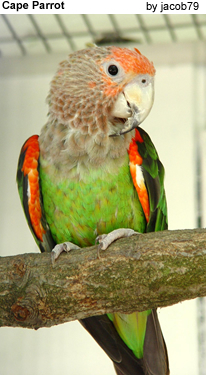 It is estimated that over one hundred Cape Parrots (P. robustus robustus) are currently found in aviculture. The survival of this species may depend on successful captive breeding programs. 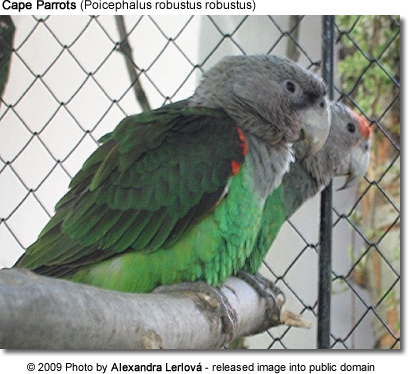 As of this time, this parrot is uncommon in the pet trade; and the trade and export of wild-caught Cape Parrots from South Africa has been made illegal by the international CITES agreement (appendix list II) and by South African law. A small trade still persists in the East and West African subspecies. Their low numbers seem to make Cape Parrots fairly unavailable as pets. But those that are kept as pets have demonstrated wonderful personalities, and a human-like talking ability that rivals their larger cousin the African Grey Parrot. It is hoped that responsible and legal breeding can help to increase their numbers. The ultimate goal would be to provide them needed protection in their native habitat. 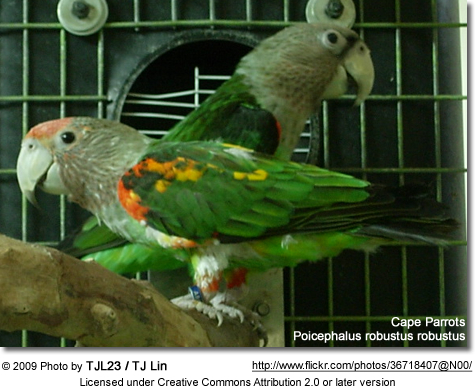 The Cape Parrot is the largest parrot of the genus Poicephalus. It is a short-tailed medium-sized bird averaging 33 cm or 13 ins in length. It has an oversized horn-colored beak that is 31-37 mm or 1.22-1.46 ins long. It is used to crack all sorts of hard nuts, especially those of yellow pine and various palms. The plumage is generally green. The head is greenish-brown to yellowish-brown flecked dark brown and dull green. In some birds, the cheeks are tinged lightly with dull pink. Occasional they have a narrow reddish frontal band. The rump, breast and abdomen are tinged with blue. The feathers to the back and wing-coverts are black with broad green edging. The edge of the wing and thighs are orange-red. The tail is blackish-brown. They have grey periophthalmic eye rings and dark brown irises. The feet are dark grey. The species is sexually dimorphic, with females sporting the bright orange frontal patch on the forehead. Immatures lack the orange-red markings to the thighs and edge of wing. They often have a reddish tinge to the forehead; and the; head and nape (back of the neck) are brownish-olive. Even biologists familiar with the subspecies cannot always visually separate individuals to their respective races. Recent (unpublished) DNA findings might indicate that the nominate Poicephalus robustus robustus may be split as a different species from the other two subspecies, although this is not widely accepted. 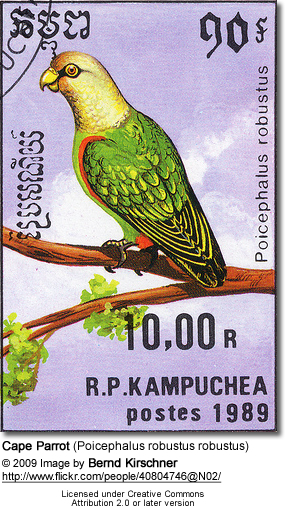 The West African Poicephalus robustus fuscicollis and East African Poicephalus robustus suahelicus have been proposed as a new species: P. fuscicollis, and its two subspecies would be Poicephalus fuscicollis fuscicollis (the Brown-necked Parrot) and Poicephalus fuscicollis suahelicus (the Grey-headed Parrot). The common name Un-cape Parrot has gained limited popularity for the proposed new species. Description: Fusccollis has a grey/brown neck. All three subspecies have dark green upper parts, light green lower parts and have orange on their shoulders. Juvenile birds have orange foreheads, which is retained on adult female parrots and is lost from the male parrots on maturity. This sexual dimorphism (visual physical differences between the sexes) enables adult birds to be visually sexed. Description: Suahelicus has a grey head.